Including a chapel at Bransford, which perhaps was originally in Powick Ancient Parish , later, or originally, in this parish. Bransford was a separate Civil Parish in 1866 from Leigh but not separate ecclesiastically. Hence this parish is ecclesiastically 'Leigh with Bransford'. 4½ miles west of Worcester, off the A4103. Braces Leigh, 1 mile east of Leigh Sinton; Castle Green, ¾ mile N. by E. of Leigh Sinton; Cherkenhill, 1 mile S.S.W. of Leigh; Crowcroft, ¾ mile W.S.W. of Leigh Sinton; Hopton, 1½ miles W. by S. of Leigh and Sherridge, ¾ mile N.W. of Leigh Sinton. Also Ashfield, Dragon's Cross, Kings Hill and Suffield. In the 19th century the parish extended further towards Malvern including the hamlets of Lower Howsell, 1½ miles S.S.E. from Leigh Sinton; Upper Howsell, 1½ miles south of Leigh Sinton; Cowleigh and Interfields,1 mile S. by W. of Leigh Sinton. Leigh Parish Registers commence in 1538. Bransford in 1767. The two parishes were not separated out for microfilming purposes. Letters, pamphlet, valuation, declaration of trust, tithe & other papers 19th- 20th cent. 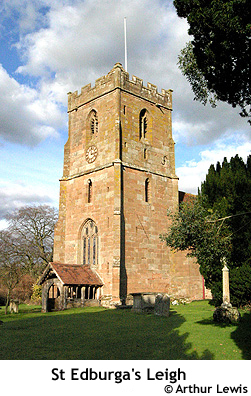 BRANSFORD, a chapelry partly in the parish of POWICK, but chiefly in that of LEIGH, lower division of the hundred of PERSHORE, county of WORCESTER, 4¾ miles (W. S. W.) from Worcester, containing 264 inhabitants. The chapel is dedicated to St. John the Baptist.